I don’t normally get this excited about a piece of technology, but this Edimax nano router is freaking awesome. You can’t really appreciate how tiny this thing is from the picture, but trust me, it’s the smallest router you’ve ever seen. It’s smaller than the cable that powers it, and the ethernet cable you attach to it. 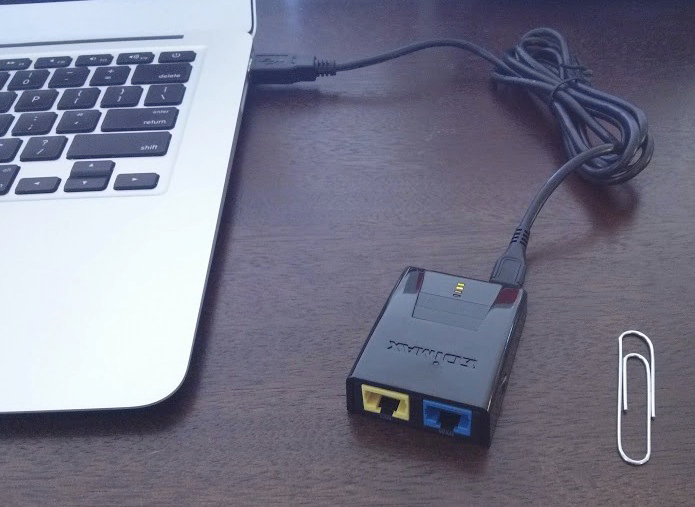 2) Working off point #1, if you have a need for setting up a headless systems — meaning there is no monitor (such as setting up the Raspberry Pi, a bitcoin mining rig, or any other linux machine that will mostly be accessed via SSH…), this thing is great because you can get an ethernet connection easily without ever needing to hook up a monitor to set up the wireless adapter. 3) When you are traveling, sometimes a wireless connection may be spotty in certain areas of the hotel room (this happened to me in Europe. The room I was in could not reach the hotel’s wifi unless you are in a very specific spot). With this device you can put it in any location and make it repeat that wireless connection to you. Problem solved. 4) Another thing you could potentially do with this device is steal paid internet. You can use this to share one paid internet connection with more than one device. I haven’t had the opportunity to try this yet, but I imagine it should be possible. Obviously most of these benefits only matter if you are not directly in front of your main router. Also, this thing is cool because it powers off of a micro usb.